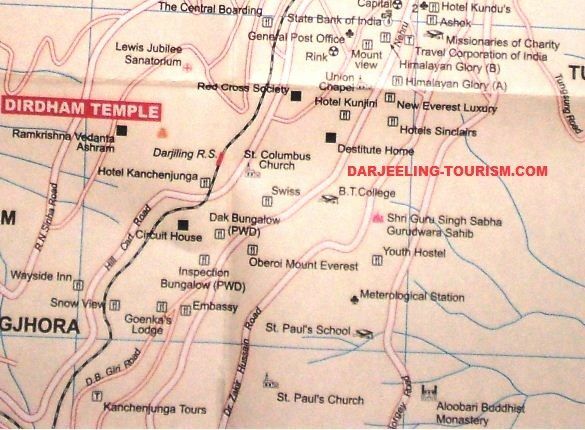 The following is a road map of the southern part of Darjeeling town showing all the major roads to and locations of the main places of interest in this part of the hill town. A section of the Hill Cart Road shows the Darjeeling Railway Station. Hill Cart Road is a National Highway and goes all the way down to Siliguri. Dhirdham Temple and Ramakrishna Ashrams are located close to the Darjeeling railway station. The second major road on this map is the Gandhi Road. Although not labeled separately, the lower part of Nehru Road is Gandhi Road. It passes through important landmarks such as PWD Dak Bungalow, Sinclairs & Swiss hotels, PWD Inspection Bungalow etc. Gandhi road also passes through the abandoned Mount Everest hotel, the lavish star hotel that was damaged by a major fire and had been left abandoned since then. Another important landmark is the Circuit House which too can be approached from Gandhi Road. In the map you can also see Dr. Zakir Hussain Road that goes via Youth Hostel, Cedar Inn and all the way to St. Paul's School and St. Paul's Church. On right side of the map you can see Tenzing Norgay Road that leads to the Aloobari Monastery. The rightmost road is Tungsung road that goes to the locality known as Tungsung.